The first in a series on the actors and institutions that shape the wine world. I’m interested in the role of wine critics (and their publications) in shaping the global wine market. This is the first of several entries that will examine a few of the most influential publications. I’m not entirely sure where this process will take me, but I’m pretty interested to find out what I will learn. So let’s begin. I want to start with Gambero Rosso, which is a very influential Italian publication. It is the Italian equivalent of Wine Spectator, but it goes well beyond WS in its coverage of food and wine culture and tourism. It publishes a number of important guides to Italian regional restaurants, food and wine that I have found to be extremely useful when I have lived in or visited Italy. The Italian monthly magazine is physically imposing – the issue that appears in the photo above weighs in at more than 400 pages and was filled with ads. I subscribe to the much thinner abridged quarterly English edition, but my comments here concern the Italian original. The name Gambero Rosso means red prawn, so it is easy to imagine that the magazine started out with a focus on seafood and expanded from there. The true explanation is a bit more Italian and a bit more political (I wrote about it in Chapter 7 of my book, Globaloney.) A group of young revolutionaries found themselves working on a Northern Italian newspaper called il manifesto in the 1970s. They formed a social club, which later evolved into the Slow Food movement, on the theory that political revolution needed to have deep social roots and to draw upon important economic sources in order to succeed (the status quo they opposed, after all, was political, social and economic, too). It is hard to imagine a better way to bring people into a political movement than through food and wine. And so their project thrived. Gambero Rosso first appeared as a slim culinary supplement to il manifesto, so I imagine the name made reference to both its “red” politics and its shrimpy size. The magazine grew to become an independent publication, spawned a number of books and guides, and now even includes a television network. It is no shrimp any more. Gambero Rosso is unique among the wine critic publications I am examining here in that it is almost entirely focused on the wines of a single nation, Italy. Although other publications may emphasize one country or region over others, all attempt some form of international coverage (this is even true of Wine Press Northwest, which covers the Washington, Oregon and British Columbia wine industries). In this as in many other things Gambero Rosso is different. Mario Batali has said that there is no such thing as Italian cuisine, there are only the regional cuisines of Italy. Gambero Rosso takes this view of Italian wines, locating each wine within its particular region and quietly seeking to reinforce regional wine identities and to resist the industrialization and homogenization of wine. It thus holds true to its Slow Food roots. Gambero Rosso has an agenda, as its il manifesto origins might suggest, and it promotes it effectively by identifying the very best regional products and local producers. Other wine critics have agendas, too, I think, but are not always so transparent as Gambero Rosso. 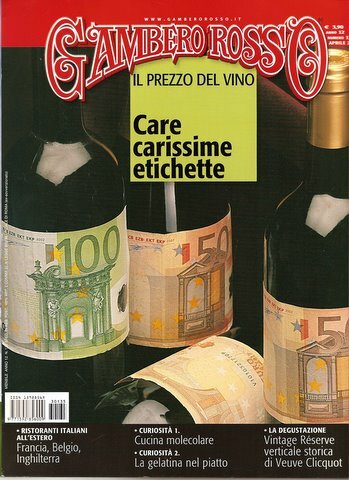 Each monthly issue of Gambero Rosso features a major section on wine, usually devoted to a particular regional wine. Winemaker profiles and interviews are accompanied by ratings and tasting notes. The ratings use the usual 100-point scale, although it is applied a bit more rigorously than in U.S. publications, I think, judging by the relatively small number of 90+ wines that appear. A surprisingly small number of wines are rated each month given the thousands and thousands of Italian wines produced. This is because the most important ratings appear in an annual guide called ViniD’Italia (one word), which is the bible of Italian wine. You can purchase an English translation, ItalianWines. The 2004 edition that I have here ran 864 pages and rated 14,208 wines from 1,937 producers. The new 2008 edition (due out later this month) is probably even bigger. Several features of ViniD’Italia are noteworthy. First, it eschews the 100-point rating system in favor a simple scale of zero, one, two or three wine glasses. The three glass or tre bicchieri wines are the best in Italy. There were only 254 of them in 2004, so this really is a high distinction and I am sure it is a tremendous market advantage to receive the highest rating. I admit that I think the wineglass rating system is refreshing and usefully informative. Tasting wine is not really rocket science at my level of (un)sophistication. Robert Parker probably really can tell the difference between an 88-point merlot and one rated 87, but I’m not sure I can. Good, better and best ratings meet my needs pretty well. ViniD’Italia is noteworthy in other ways in comparison with other wine guides I have seen. It is organized by wine region (and then by wine town) rather than wine type, producer or some other system. The idea seems to be that regional identity really counts and so you should be thinking about comparing wines based on their terroir and the qualities of the people who make them rather than just grape varietal or brand name (there is no emphasis on brands here at all). Within regions, each important producer gets a single page. Terse but data-packed text evaluates the winemaker’s progress since the last publication and surveys briefly the changes the tasters perceive. Then a small number of wines are rated and compared to some of the same wines from the same producer in previous years, with relative cost noted to provide a quick index of value. The book is frankly hard to use if you are standing in a wine store, flipping back and forth trying to find out how different wines (from different provinces and cities, made in different vintages) come out in the ratings. But I doubt that the editors really care. You are supposed to learn to use it their way, not your way. They want you to stop thinking about wines except in terms of their regional and local identities and to make more disciplined and informed choices, taking the long term development of quality producers into consideration. The Gambero Rosso publications want you to think about wine in a particular way that reflects its original political agenda and distinctive Italian roots. In many ways it is exactly the opposite of the wine guide I’ll consider next, Decanter.